Why it works: The 76ers already told Ben Simmons that they will draft the LSU forward number one overall. Not surprising. Noel's name has been involved with a number of pre-draft trade rumors already. The number six overall pick in the 2013 draft dealt with injuries last season but had a decent sophomore season overall, averaging 11.1 points and 8.1 rebounds. While Noel has a bright future, Philly also has veteran Carl Landry and rising sophomore Richaun Holmes at the power forward position. Given the team's pressing need to upgrade at the point guard position, Noel is expendable. 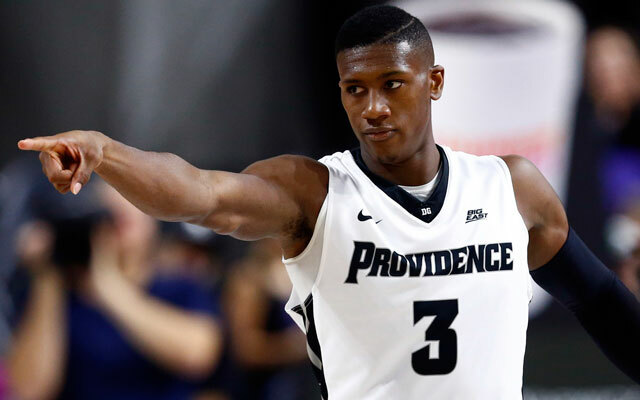 By trading Noel and a late first round pick for the fourth overall, the 76ers get to draft Kris Dunn, effectively landing their starting small forward (Ben Simmons) and their starting point guard in the same draft. Philly's young core would be brimming with potential featuring Simmons, Dunn, Okafor and a finally healthy Joel Embiid. Phoenix loses a top five pick, but gains another first round pick. The Suns already have picks #13 and #28. In Noel, the Suns get a young power forward to compliment aging center Tyson Chandler and future starting center Alex Len. Power forward Mirza Teletovic, the team's fourth leading scorer, is an unrestricted free agent as is power forward Jon Leuer. Why it works: It's been a rocky road for the Kings and All-Star center DeMarcus "Boogie" Cousins. Cousins has been suspended by the team several times and has publicly clashed with his coaches. By trading Cousins, the Kings rid themselves of a soap opera that has become toxic to the franchise. The Kings have fired five head coaches since Boogie was drafted. While Cousins cannot shoulder all of the blame, it seems as though no coach has been able to build a relationship with the talented but sullen center. The Kings not only free up cap space with Cousins' departure, but they also get a starting center in Omer Asik. While he is nowhere as talented as Cousins, Asik is a capable starter. The Kings also add another top-10 pick as they already own the 8th overall. With two lottery selections, they can add players to build around rising sophomore center Willie Cauley-Stein, the number six overall pick last year. The Pelicans swap out Asik for Cousins, and by pairing him with fellow Kentucky Wildcat Anthony Davis, they form arguably the best front court duo in the NBA. There will be no player available at number six that would have a bigger impact than Cousins. The Pelicans have two second round picks from which they can use to add some young talent to their roster. 3. Cavs trade Kevin Love to the Celtics for #16 overall and Amir Johnson. Why it works: Love doesn't fit in with the newly crowned NBA champs. Being the third option on offense has never seemed to mesh well with him. He averaged 16 points this past season, which is ten points less than what he averaged in his final season with Minnesota. In this year's postseason, his averages have also dipped from the regular season. His health has played a major factor as injuries have limited him. The Celtics have long pined for Love and if he can resemble his Timberwolves' self, he'll provide the scoring sidekick for rising star Isaiah Thomas. Amir Johnson signed with the Celtics last season after flourishing in Toronto, but Boston's logjam in the front court sent his minutes and scoring down. By trading Amir, the Celtics free up the log jam and add more cap space, and Amir gets a chance to reinvigorate his career. Boston has three first round draft choices this year, including the third overall, so giving up one doesn't hurt. By trading Love, the Cavaliers shed his hefty contract, which has a base of over $22 million next season. Seven of Cleveland's players will be free agents this off-season so the cash saved from Love's contract can be used to re-sign their own players and go after a free agent or two. Maybe LBJ pal Dwayne Wade? The Cavs also don't have a first round pick this year so they get a middle first round pick where they can add a young player to an aging roster. Pairing Amir Johnson with Tristan Thompson would also give the Cavs a strong defensive front court. Why it Works: Clippers have 8 unrestricted free agents and only $15 million in cap space for 2016. They will be forced to make some tough decisions. This past season was very difficult for Blake. He missed 41 games with a left quadriceps injury. He was also suspended four games for punching a Clippers' staff member. In the first round playoff loss to the Trailblazers, he re-injured himself and was limited to only four games. By trading Griffin, the Clippers free up his large contract, move into the top ten of the NBA draft and get Terrence Ross. Ross is 25 years old, younger and cheaper than forwards Jeff Green and Wesley Johnson, both unrestricted free agents. Veteran forward Paul Pierce, who will be 39 before the start of next season, has yet to decide whether he will return next season or retire. With the ninth overall pick, the Clippers will have options at forward including Domantas Sabonis or Henry Ellenson. The Clippers also hold the 25th overall selection in the draft. The Raptors' number one priority this off-season is re-signing DeMar DeRozan. If Toronto resigns DeRozan, he along with Griffin and Kyle Lowry form a "big three" and threaten the champion Cavaliers for the Eastern Conference. If the Raptors lose DeRozan to free agency, then at least they've added an All-Star in Griffin and remain a playoff team. This would require a sign-and-trade as Dwight Howard is planning to opt-out of his contract. Why It Works: If Houston is going to lose Dwight Howard to free agency, they're better of trying to maneuver a trade and receive a player in return. Last season, Howard had his lowing scoring average since his rookie year in Orlando. Howard still averaged 13.7 points, 11.8 rebounds, and 1.6 blocks per game - pretty good numbers. Chemistry, or lack thereof, hurt the Rockets' chances of making any noise in the playoffs. Injuries have curtailed Derrick Rose's playing time and effectiveness in Chicago. Over the past four seasons, the former league MVP missed 168 games. While no longer the explosive player he once was, Rose is still a solid scorer and still capable of running an offense. Jimmy Butler is the leader of the Bulls and this is the time for Chicago to part ways with Rose. With Rose running the point guard, Harden gets to focus on what he does best - scoring. Rose is an upgrade over Patrick Beverly and 38 year old Jason Terry. For the Bulls, Joakim Noah is a free agent and despite missing the majority of last season with injury, the Bulls will look to lock up the two-time All-Star who has played all 8 of his seasons in Chicago. Pau Gasol is set to hit free agency after playing the second season of his three-year, $22.3 million contract. Gasol might be looking to change jerseys. Pairing Noah and Howard together would form a formidable defensive front for the Bulls. Chicago is expected to have just over $16 million in cap space this coming off-season. While Howard would likely garner a max contract, the Bulls would have enough cash from Rose and Gasol's departures to address the point guard position in free agency where players such as Mike Conley and Rajon Rondo will be available.